There was some more coverage in the press a few weeks ago on paying – or not – authors for appearing at book festivals. How about if we start 2016 with the intention of paying authors who come all the way to your little corner of the world to stand up in front of fans and speak? It’s been said before, and I suspect even I might have said something, but how come theatres don’t expect their actors to appear on stage for free? The exposure could be good. Maybe another theatre would notice them and ask them to come and act on their stage for free as well. I saw in the Independent that Hay has more visitors than the other festivals, and they are one of the ‘let’s give them some wine’ persuasion. And the thing is, the wine, and the handling of it, can’t be totally free either. So why not hand over cash instead? If there isn’t enough money already to cover this dreadful expense; how about charging slightly more for tickets to the events? After all, by the time you get to Hay, you have spent or will spend a fair sum on travelling, eating and possibly sleeping. Let’s surprise ourselves, and the lovely authors of the books we enjoy so much, by treating them like plumbers. My own first Scottish year is almost complete. The weather is a little on the wild side at the moment, but I’m trusting we will get safely to the end, and out the other side into 2016. 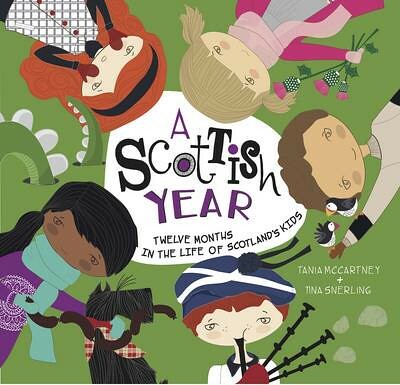 A Scottish Year, twelve months in the life of Scotland’s kids, by Tania McCartney and Tina Snerling, is as the title suggests not entirely a Scottish production. I had hoped for a more specifically Scottish book, with interesting facts about children in my local area. It seems that this is part of a wider series of ‘kids’ years’ and it shows. Their Scottish advisors, and the local school children who helped, are very local to me, and I’m sure they gave all he right answers. I’m less convinced that the questions were the right ones. But anyway, it’s a nice enough book, and the children featured are nicely pc, comprising three girls and two boys; one with red hair, one white immigrant and one Pakistani. They trail through the calendar, telling the reader about typical things that happen in a year, which includes both the same stuff that nearly everyone knows about, or does, as well as typically Scottish things. So you might eat pieces, or curry. There’s haggis and blaeberries and loud bagpipes. You have shinty, unicorns (apparently) and caber tossing. Lots of tartan. Castles. I may have mentioned the Great Grandfather’s jigsaws before. Or not. I’ll mention them again, just in case. He liked woodworky stuff and had a variety of exciting tools and made a number of things that we still have around the house. And he made jigsaws. With the jigsaw, I presume. They are most devious, and to my mind almost impossible to do. But the in-law relatives enjoy them and swap them, and there can be big gatherings over the jigsaw board. We didn’t have a big group of people this Christmas, but the Resident IT Consultant popped over to the late Grandmother’s flat to steal some jigsaw puzzles (what with me having placed the Christmas tree in front of the cupboard doors where we keep ours…) so he would have something to occupy himself with. Below is what he left to ‘someone else’ to finish after a long session. Daughter pronounced it impossible, but still managed it after some mutterings. In one way it seems perfectly easy. I mean, you pick up one piece and try it in one spot, until you find the one that fits. And so you go on. Looked at another way, what Daughter was left with was a pile of almost identical snowflake shaped pieces in off-white. Which is fine. 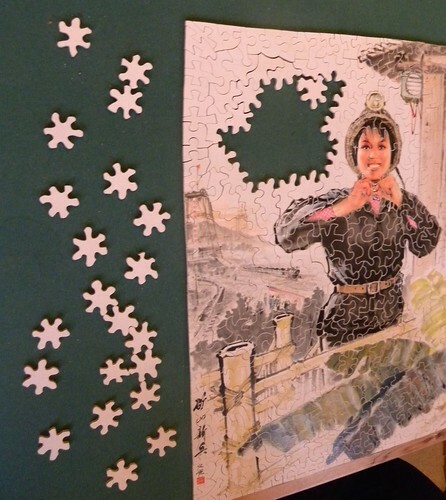 I just don’t quite get how a group of snowflakes will fit and fill the remaining hole in this Chinese mining poster, despite the fact that I remember ‘helping’ to do this very jigsaw some thirty years ago. Possibly I just stood on the sidelines and cheered. I have allowed a certain amount of channel surfing over Christmas. It’s not something I do myself. Much. I’m actually never quite sure how to change television channels, and I tend to stick with a few programmes, and don’t generally have enough time to sit and pick the least bad thing to watch. When I saw that David Walliams was going to present Britain’s Favourite Children’s Book on Boxing Day, I decided to boycott the programme. Which is why I ended up catching a bit of favourite Disney songs instead. That was nice enough, and I always enjoy the Bare Necessities, even if I’m not allowed to wriggle my behind the way Baloo does. And when the singalong ended, I inevitably found myself in the company of David Walliams anyway. He did the job competently enough, but I wish a more ‘ordinary’ author could have been given the task. It was fun to see how many former children’s laureates they were able to dig up to come and talk about their popular books. The selection of books was good. But did they actually say how they had been chosen, or by whom? The children they had on the programme were well read, and amusingly precocious, but they weren’t exactly Winnie the Pooh fans. So what made this bear the best? Then we moved on to – the planned – watching of And Then There Were None. It’s good. I read the book so long ago, that not all the facts remain as fresh in my memory as they should. But this isn’t going to end well. (Unlike the stage production I saw in 1970 where they decided to go for a happy ending…) And I vaguely recall a creepy film version from maybe forty years ago. I think. I wonder what Agatha would have said about the bare chests? 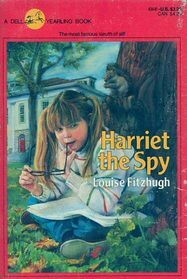 I was a bit disappointed by Harriet the Spy. 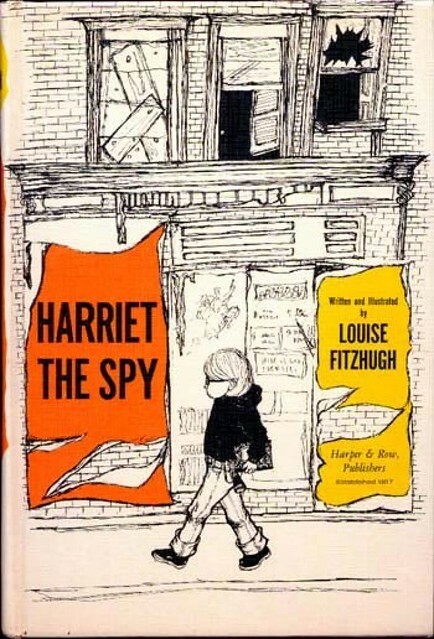 Louise Fitzhugh’s 1964 novel had been recommended to me, and although I didn’t exactly rush to read it, I fully expected it to be something it wasn’t. It’s a rather charming period piece, set in New York over fifty years ago. It’s the kind of New York it’d be nice to be able to see for yourself, and almost impossible to imagine today. You have to admire [some of] Harriet’s observational skills. She creeps round the neighbourhood collecting data on people in her notebook, to which she is permanently attached. She sees all these things, but she fails to understand what they mean, what makes people tick. Harriet also fails to allow others to be different. It’s all about her and her ways. Her nanny is sacked, and everything goes wrong. Her teachers ‘don’t understand her’ and her friends and non-friends alike turn on her. In a way, what this really is is a book by Rebecca Stead, turned on its head. I.e. it’s the plot as seen by the ‘bad’ child, rather than the usual point of view. And then, everything is ‘fine’ again, which is fine by me, but I didn’t admire the ways it was made fine. And so they lived happily ever after. With my fondness for happy endings, I was more than satisfied with the – somewhat – cheesy romantic solutions at Downton. The big question now is, what on earth do we watch in its place? This year was an unfortunate time to assert Harper Lee’s one-novel status. But, these things happen. The second quiz book, on trains and stuff, turned out to be mostly a one-horse race. And I’ve not read a thing. 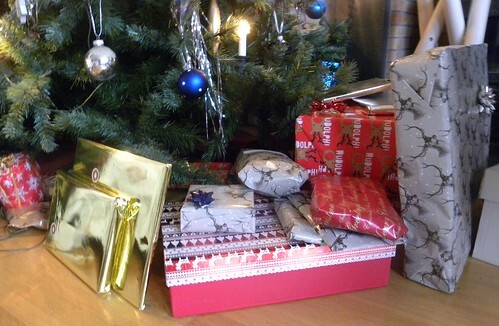 We ate a lot, and at the end of the day we opened the presents (which has the added advantage that I can now reach to switch off some of my decorative lights again). They were mainly flatpacks. Hard parcels as the Swedes say. The Resident IT Consultant had already owned up to giving only books. As if we needed any more! Admittedly, I did ask for a Margery Allingham I’d discovered we didn’t seem to own. And I actually got a piece of furniture in one of my parcels. Daughter got the most in number, the Resident IT Consultant seemed pleased with his slippers and chocolate marmite, and Son and Dodo will be melting cheese for fondue from now on. That is if they manage to stagger home under the weight of fondue pot and cheese packs.